The First Class Customs Inc. Private Class Sprinter. The Ultimate in Custom Luxury Sprinters! Full Recliners, slide out desks and much more! When the time has come and you have decided that you require the pinnacle of personalized luxury look no further. 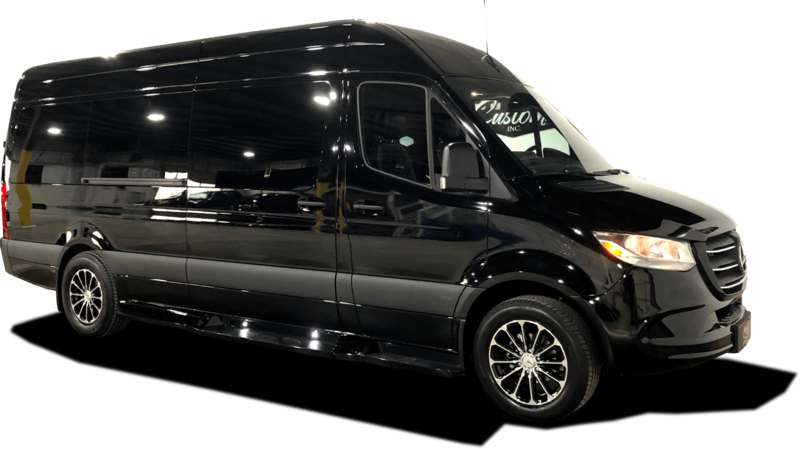 First Class Customs, Inc. is proud to introduce our exclusive Private Class Custom Mercedes Sprinter. Featuring our exclusive design with a wide variety of specialized equipment and trim found only on this model. Our Private Class Custom Sprinter offers our customers the quality fit and finish found in coachbuilders twice the price. Our standard floor plan for this model features four VIP Chairs along with a three person bench along the back wall. (Seating for Seven in the Rear) We also offer a wide variety of seating options in this model with multiple floor plans available. Our objective is to allow customers to be involved in the build process every step of the way by choosing colors, fabric, wood trim and a host of electronic options. We encourage our Private Class Customers to work with our sales team to select equipment that will ensure that your fully custom Mercedes Benz luxury Sprinter will be everything you want and more!